Upon arrival at the outlet, we were ushered to our seats, served with one of Ippudo's interesting strawberry drink concoction, and left to wait to try out their Hakata Tsukemen dish as well as three interesting sushi rolls. The strawberry drink was named Red B.F.F, being this ice blended strawberry with tropical juice. I did like the sweetness of the juice, with a slight fizzle that left me feeling rather refreshed and ready to try out their ramen! The chef explaining the new dishes, and how we're suppose to eat it, the correct way. A quick introduction to the dish, and we were even taught on how to fully enjoy the Hakata Tsukemen dish. With pictorial step by step and demo given, it was just a matter of trying it out for ourselves. But just for the record, the steps to eat tsukemen are as follows. Check out the pictorial diagram below. 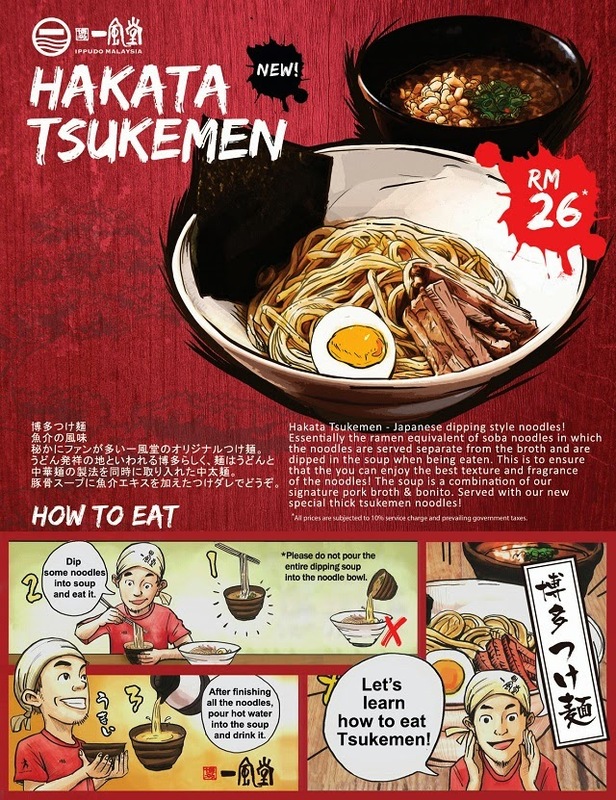 Learn how to eat Tsukemen boys and girls! The Hakata Tsukemen, or Japanese dipping style noodles were basically cold noodles, which we were supposed to dip into this very healthy bowl of signature pork broth and bonito. We weren't allowed to pour the soup unto the noodle, and instead was adviced to dip each mouthful into the piping hot soup and slurp it up into the mouth. I do advice to follow their instructions, as the soup can get pretty salty due to the intense flavour of the pork soup. Personally I love the soup, as it went well to heat up the cold noodles before being slurped into our mouth. 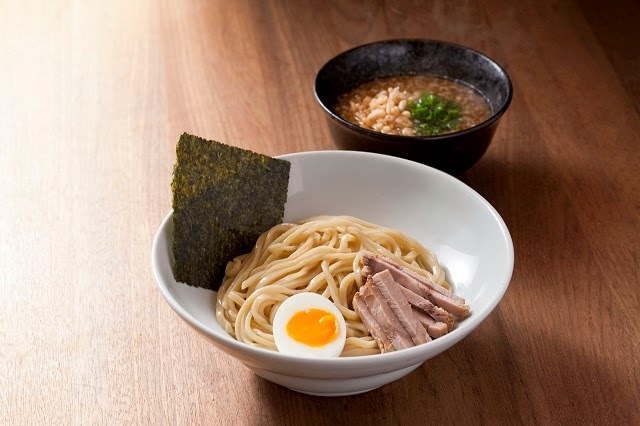 The ramen equivalent of soba noodles in which the noodles are served separate from the broth gives a very unique twist to how we usually have our noodles. Good stuff here, highly recommended. After our fill of the Hakata Tsukemen, we were served with an assortment of sushi, namely the Spicy Tuna Roll, Unagi Cheese Roll, and Salmon Avocado Bacon Roll. The spicy tuna roll was basically tuna roll served with homemade spicy mayo. The spicy mayo brought out the flavour of this sushi, giving it that spicy edge. The Unagi Cheese Roll had these homemade cheese mayo on top, with delectable unagi rolled in between, while the Salmon Avocado Bacon Roll came served with fresh salmon together with avocado and bacon bits. Not bad at all, a fusion of flavours for the discerning diners. Overall it was a pretty interesting dining experience that evening over at Hakata Ippudo Malaysia Pavilion KL where I had a taste of the unique but delicious Hakata Tsukemen. Do drop by their branch in Pavilion KL the next time you're over at Pavilion KL doing some shopping and want to have some ramen and Japanese dishes.